40 was poor: 4 QSOs. 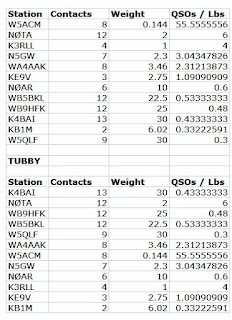 80 was great: 9 QSOs from AL, CO, TX, IL, IA, MN. Just needed more activity. 73/72, John, K4BAI. Two contacts on 40m, and six on 80m, running 3W to 5W. Local noise levels were very high as usual, keeping me from giving decent signal reports. As always, the Spartan Sprint operators did an outstanding job. Thanks to all, and especially Richard, KI6SN, for creating and sponsoring this event! 72! 40 meter effort yielded a few SP contacts this evening. Operated from the shack using a KX3 into a dipole at 30 feet. Heard a couple other stations calling but couldn’t work them. Propagation wasn’t great but the band seemed quiet here. Thanks for the Qs hope for more next month. Another slow Spartan Sprint. Thanks for the Q's. Kx2, vertical, Gen Log. K3/10 @ 5W to a 40M extended double Zepp. 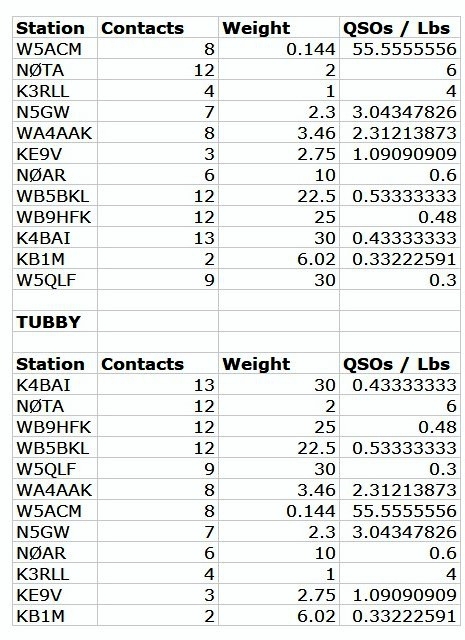 QSOs evenly split between 40 and 80M. 9 states this time - nothing west of Colorado. Best signals: 40M - K4BAI and KFØN, 80M - K4BAI and WB9HFK. QSB was at times brutal - my thanks to all that persevered. Had fun. The ATS-3a was doing quite well this month. My CW was “OK” with no additional burnishing on the paddle contacts. The batteries appear to be running well. I use a pair of 170 mAh LiPo cells. The radio makes 3W out, and this is the longest service I have had from this type of LiPo cells in this rig. Conditions were nothing special, but 80M was a bit better than last month, and participation was UP! I got 3 QSOs on 40M, but a surprising 5 QSOs on 80M. Thanks to all! 72 de Andy W5ACM, Houston, Texas. So, What's a Spartan Sprint, and How Do I Play? 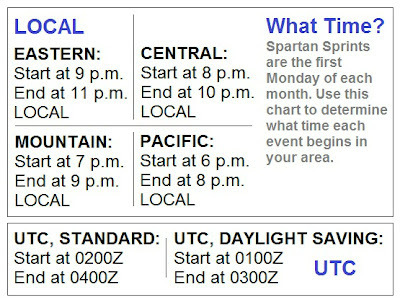 Spartan Sprints are two-hour gatherings sponsored by the Adventure Radio Society, held the first Monday of every month. The Spartan Sprints have a unique, three-faceted focus. They encourage outdoor operation with back country radio gear (if outdoor operation isn't practical, home-based operation is fine). They gather fascinating information about the upper atmosphere, documenting how low power signals can travel long distancs. And they encourage the growth of a like-minded community of amateur radio operator who generously share their knowledge and experiences. Bands of operation are 80 meters, 40 meters, 20 meters, 15 meters and 10 meters. You may operate any number of bands - your choice. Many Spartan Sprint operators gravitate to the QRP CW calling frequencies on these bands. Spartan Sprinters use 5 Watts or less. We encourage you to experiment with 1 Watt or less. You will be surprised at how effective these low levels can be, and how much fun QRPp really is. Similarly, we encourage you to experiment with simple wire antennas. And we encourage Sprinters to use equpment they built from "scratch" - that is, equipment built from schematics. Exchange RST, SPC (state, province or country) and power output. If you choose to call CQ, use the format "CQ SP," or "CQ QRP TEST." You can give yourself credit for working the same station on a second, third, or fourth band. What Is the Weight of My Station? The weight of your station is determined by weighing everything at your operating position up to, but not including, your feedline and antenna. In other words, your rig, key, keyer, antenna tuning unit, battery, headphones and so on. 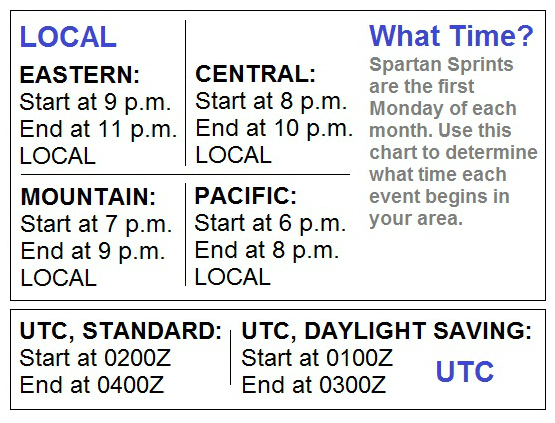 The results of each month's contest appear on the Friday following each month's first-Monday Sprint. They are posted here on this website. You can find results from previous months here, as well.